Scotch® Reinforced Strapping Tape 863 is a clear tensilized polypropylene backing with polypropylene ribs and a synthetic rubber resin adhesive. 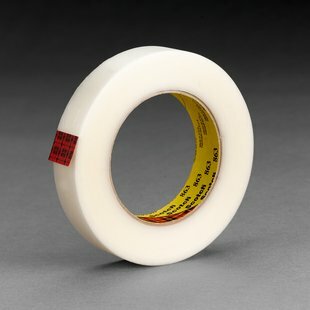 Light duty, economical, black polypropylene reinforced strapping tape. Synthetic rubber adhesive has good shear strength to fiber board surfaces for bundling, strapping and reinforcing applications.